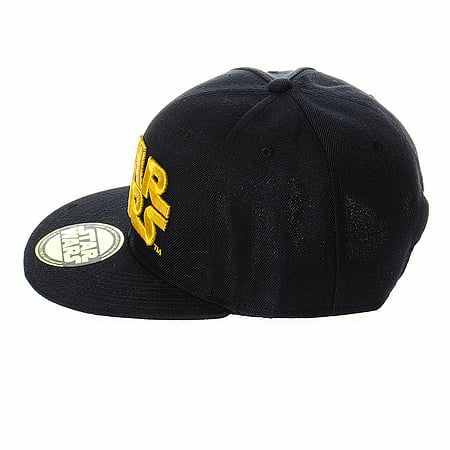 Bring some Jedi force to your image with the black Star Wars Logo Baseball Cap. Star Wars merchandise and memorabilia has to be one of broadest franchise collections, but rarely does it get much cooler than a Star Wars flat peak. With this Star Wars Logo hat you'll be shining your admiration to the galactic Sci-fi whilst still retaining you crisp and fresh image. The golden text on the hat has been taken from the familiar authentic title that appears within the lengthy opening crawl of the films. 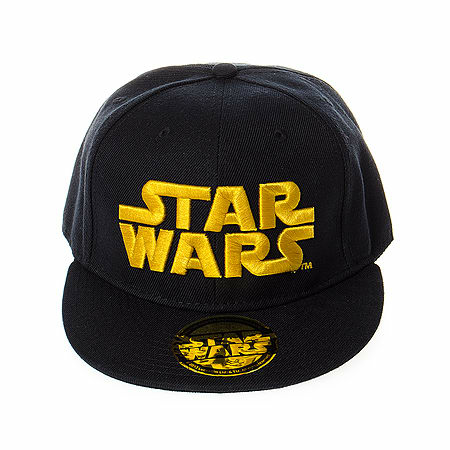 The gold Star Wars logo is really helped to stand out against the all over black shade of the cap. With this Star Wars baseball cap even the proudest of hermits will understand what Sci-fi film you adore.This black Star Wars Logo Baseball Cap could be your latest smart addition to the existing Sci-fi merchandise and Star Wars clothing you may already have. Perhaps this will be your first Star Wars accessory, then what better way to start, because this classic Star Wars hat will have you battling the Darkside whenever it's worn.